Not the 1970 Harold Robbins fiasco, but a sturdy British would-be action drama set in South Africa about the squabbling members of an expedition searching for a cache of diamonds. 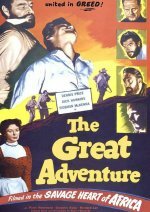 Jack Hawkins, on his way to major stardom, is cast against type as a villain, who enlists an unconvincing Dennis Price, a young Peter Hammond and Grégoire Aslan to help him recover the treasure. This could have been quite stirring if it hadn't been morbidly under-directed at a snail's pace by David MacDonald. In the US it ran 12 minutes shorter and was twice retitled, as The Great Adventure and Fortune in Diamonds.